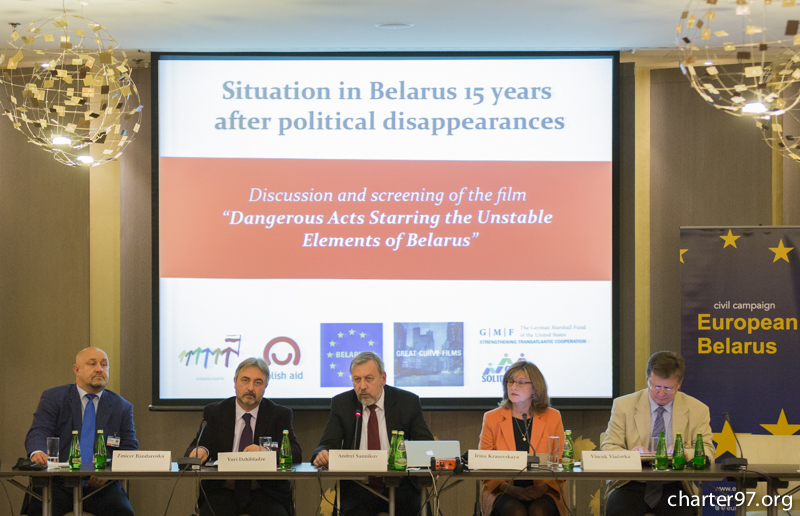 On September 25 in the framework of the OSCE meeting on Human Dimensions, held in the capital of Poland, a conference called “Situation in Belarus: 15 Years after Political Abductions” was held. It was organized by “European Belarus” foundation. As charter97.org has found out, the conference was attended by the leader of “European Belarus” civil campaign and a presidential candidate in the election of 2010 Andrei Sannikov, the wife Anatoly Krasouski, a businessman abducted in 1999, Iryna Krasouskaya, a member of the organizing committee of “Belaruski Rukh”, a former chairman of the Belarusian Popular Front Party Vintsuk Vyachorka, representatives of the Working Group for Investment of the Committee on International Control over the Human Rights Situation in Belarus Volha Zakharava and Yuri Dzhibladze, a coordinator of “European Belarus” campaign Zmitser Bandarenka, other well-known politicians, human rights activists and experts. The event attracted interest of well-known politicians, diplomats, human rights activists, experts and journalists. The leader of “Viasna” human rights centre, a former political prisoner Ales Bialiatski, a Deputy Assistant of the US Secretary of State Thomas Melia, the head of the US delegation at the conference in Warsaw Brian Atwood. “Russia’s aggression against Ukraine and the war unleashed by Moscow have challenged the basic OSCE principles and documents,” Andrei Sannikov said opening the conference. “They are primarily the Final act and Paris Charter, which had established inviolability of after-war Europe’s borders. So the OSCE should be particularly active in defending the principles it had been founded on. Considering the situation of the war, it is necessary to apply the criteria used by this organisation strictly, including the ones concerning elections. It is important for Belarus as well. The regime in our country has not changed. This event is called “15 years after political abductions”, and throughout this period the situation was only getting worse. The regime employs different methods against its opponents, but all of them are aimed at their destruction, including the physical destruction as well. The Belarusian regime has not changed, but the attitude of Europe has changed unfortunately. Today Europe is ready to view Lukashenka as a kind of a “peacemaker”, as the lesser evil as compared to Putin, it is ready to conduct a dialogue with him, as evidenced by high-level contacts. It is to cause even greater crackdown and would not help democracy. 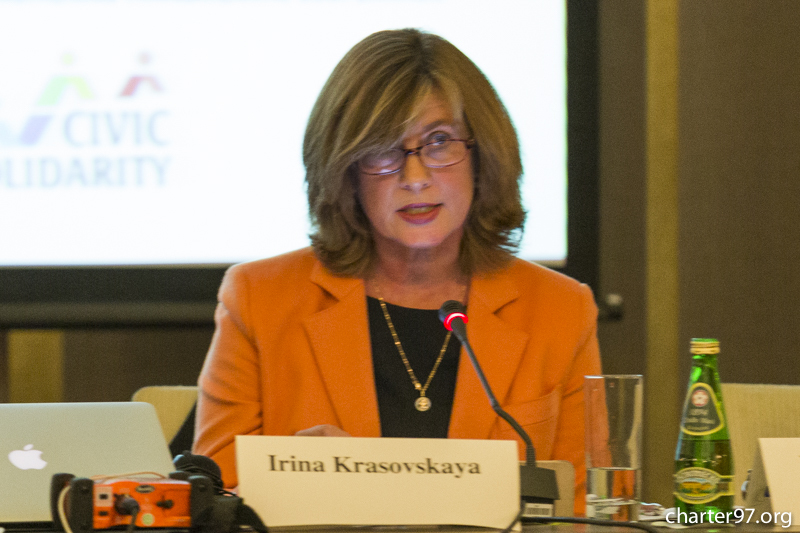 Iryna Krasouskaya reminded that Belarus still refuses to fulfill its obligations in the framework of the OSCE and other international organisations. “September 16 marks 15 years after my husband Anatoly Krasouski and Viktar Hanchar were abducted,” she said. “It was not the first and not the last abduction. On May 7, 1999 Yury Zakharanka went missing. On September 16 Viktar Hanchar and Anatoly Krasouski, on July 7, 2000 – Dzmitry Zavadski. All these abductions took place before the election in 2010. These assassinations helped Lukashenka to monopolize the power and turned Belarus into the last dictatorship in Europe. If his opponents had not disappeared then, we would live in a completely different country. Information about how these people had been abducted, started to leak out to the press in 2000. A copy of General Lapatsik (Lopatik) report emerged, and there he charged Viktar Sheiman with giving an order to abduct Yury Zakharanka, Viktar Hanchar and Anatoly Krasouski. These testimonies are known not only to us, but to the world community as well. In 2004 in the report of Christos Pourgourides it was told that the continuing investigation of forcible abductions in Belarus had been carried out at an adequate level. On the contrary, at the top level everything possible had been done in order to conceal the truth about what had happened. He also came to a conclusion that high-ranking officials could be involved in those crimes. In the same repot it was stated that the abductions could not have happened without the president’s knowledge. Exactly then the officials mentioned in the report of Christos Pourgourides were blacklisted, they were banned from entering the EU and the US. In 2006 Lukashenka and other officials were added to the list. For 15 years relatives of the abducted have been trying to find out the truth. We have won the suit against Belarus at the UN Human Rights Committee. It was proved that Belarus violated its obligations during investigation of Anatoly Krasouski’s disappearance. The authorities of the country were demanded to hold an open investigation of this crime, give adequate information about its results and take measures to prevent such disappearances in the future. But the authorities of Belarus had not planned to do anything and do not plan to do anything in the future. Many other international organisations - the OSCE, the Council of Europe, the European Parliament, – have also adopted many resolutions and appeals with a demand to carry out investigation of high-profile disappearances. However, the authorities of Belarus do not react to that. Vintsuk Vyachorka stressed that in the today’s situation Lukashenka’s regime cannot be a guarantor of Belarus’ independence. “Could the desire of Lukashenka to secure his power be used now as the means to defend the independence of Belarus in the face of the obvious threat? Some people say that Lukashism is the lesser evil, not so terrible for the future of Belarus,” the politician said. “However, recently the latest findings of an interesting opinion poll in Belarus in June were published. It turned out that people discriminate between the state, the nation and the dictatorship. And for Lukashenka it is important for these three notions to be united. People were also asked about their actions in response to a possible occupation of a part of Belarus by Russia. It turned out that those who are devoted to Lukashenka, are not ready to take up arms to defend Belarus in a critical situation. Yury Dzhibladze reminded about the events of 2010, and that political prisoners still remain behind the bars in Belarus. “Over the 4 years which passed after the beginning of the new wave of crackdown, after December 19 the situation in Belarus has not improved, on the contrary, it has deteriorated in many respects, including respect to the basic human rights and freedoms,” he said. “Now a crucial moment for Lukashenka comes: the so-called elections in 2015 are, from his point of view, to guarantee international recognition of his legitimacy. It is important to remember that since 1995 none of the elections or referendums in Belarus were recognized by the world community as legitimate, fair and free. It is extremely important for the regime today to secure this legitimacy for the first time, in order to get this recognition, guarantee for them access for financial resources of the West, through trade, through loans and other channels. And over the last month the regime is carrying out an unprecedented diplomatic performance in the West in order to obrtain renewal of a dialogue without conditions, without any changes inside the country. Concurrently Lukashenka is doing everything possible inside the country in order to guarantee absence of any serious challenge to his power or any sort of criticism by the civil society and protests of citizens. In addition to crackdown, which had been continuing through all these years, adoption of repressive laws, disband of demonstrations, massive preventive arrests, detentions during the world ice hockey championship, he also adopted amendments to the electoral legislation, which outlaws appeals to boycott elections. It seems to us that though the situation remained without improvements for all these years, despite release of a number of political prisoners, now there is a unique opportunity to use the two main vulnerabilities of the regime. The first one is its immense desire to guarantee legitimacy and recognition of the so-called election in 2015 by the world community. The second one is a fear of Russia. Lukashenka is seriously afraid that here could be aggression from Moscow or some kind of a plot with the aim to oust him, putting the country under a full Russian control in this or that way. The events in Ukraine have influenced all the leaders of the post-Soviet countries considerably, and Lukashenka is one of the first who has taken this threat seriously. That is why we believe that the OSCE, its member countries, its institutions should use this opportunity. A long-term observation of the OSCE Office for Democratic Institutions and Human Rights at this election should be secured, for a few months, insisting on the fact that only a long-term observation could demonstrate and ensure free and fair election. I think that Lukashenka would agree to that, as he needs this legitimacy and recognition badly, and then in a package with this demand in this talks, all those requirements and demands, constantly put forward by the world community and people inside Belarus since 2010, should be presented: release and rehabilitation of all political prisoners, lifting any restrictions against those political prisoners who had been already released, annulment of all repressive laws against freedom of speech, freedom of assembly, freedom of association, cancellation of the amendments in the electoral code which outlaw appeals for election boycott, and sanctioning the return of the OSCE mission with a wide mandate to Minsk. Zmitser Bandarenka has stated that the victory of democracy in Belarus is a precondition for existence of a free and independent Ukraine, and can bring about changes in Russia. “It’s a frequently heard opinion that the Soviet Union had been a totalitarian state, while the modern Belarus is an authoritarian country,” he said. “But at the same time, in today’s Belarus the number of policemen per capita is sevenfold more than in the totalitarian Soviet Union. In the Belarusian society repressive crackdown is carried out not only against opposition and intelligentsia. The most oppressed part of the Belarusian society is officials and CEOs of plants. When after the election of 2010 we found ourselves in the KGB prison together with the majority of presidential candidates and campaign headquarters leaders, we were surprised to find out that our neighbours in the prison cells were directors of leading Belarusian enterprises, which are called national brands. Those people shared the horror of tortures and humiliating treatment in the KGB prison in December 2010 – April 2011 with us. Another element of resilience of the political system of Belarus is the slave labour of Belarusian workers and agrarians. Our colleagues from the human rights centre “Viasna” and the International Federation of Human Rights told about that yesterday. Sometimes a question is heard: where are leaders in Belarus, why are they not heard? But as you know from the report of Iryna Krasouskaya, many leaders in Belarus have been murdered. Despite the existence of such a regime in the centre of Belarus, once in a few years Belarusians rise up. Dozens of thousands people take to the streets of the country’s cities. It is often connected to a presidential campaign. Every time it is a great surprise for our friends and partners in the West. Recently I had a discussion with a prominent strategist of the Republican party of the US. He asked: “Why haven’t you warned us that such events were going to take place in Minsk in 2010?” We had warned about that, but maybe not effectively. And now I say: “An uprising is going to take place in Belarus in any case, as people do not want to live under a dictatorship.” And today it’s impossible to be friends with Lukashenka, making him a good guy, and Putin a bad one. A free and independent Ukraine cannot exist without a free and independent Belarus. Another participant of the conference, Orest Deychakiwsky, advisor at the U.S. Commission on Security and Cooperation in Europe (the Helsinki Commission), agreed with the coordinator of “European Belarus” and commented on the results of the conference to charter97.org website. The conference ended by a viewing of a film by Madeleine Sackler “Dangerous Acts Starring the Unstable Elements of Belarus”.